Rinnai is one of the most legendary brand in the gas appliance market. They were established 1920, and started their business with manufacturing and sales of pressurized type gas oil stoves. About a decade later, they decided to venture into gas appliances. Rinnai led the market for gas appliances including tabletop stoves, ranges, gas ovens, and hot-water units, and the history with high trust and achievements has begun. But, It wasn’t until 1964 that the company began designing water heaters. Nowadays, Rinnai is widely regarded as one of the most authoritative tankless water heater brands with over 30 million tankless water heaters installed around the world. Rinnai has 20 branches, six domestic production facilities, and 86 sales offices worldwide. To put it simply, they have made a name for themselves in the hot water industry and they have come to be synonymous with quality, performance and innovation. 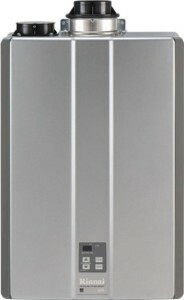 Rinnai is one of the best tankless water heater brands out there. 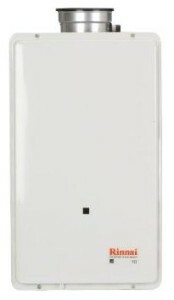 We have come across a ton of you who have used and loved Rinnai tankless water heaters. These water heaters are fully capable of providing you with an endless supply of hot water even for simultaneous multiple tasks such as taking a shower, doing the dishes or washing a load of laundry. 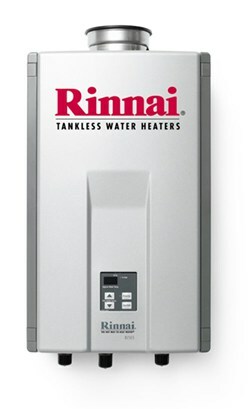 With these water heaters, you won’t need to prioritize your household chores or daily activities that require hot water as these water heaters are very efficient (some Rinnai tankless water heaters can deliver up to 9.5 gallons per minute). They are also vey economic. 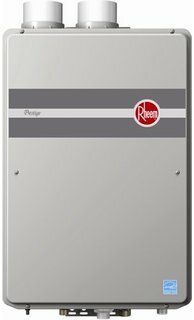 By operating only when hot water is required, and with no water in a storage tank to heat and reheat, Rinnai tankless water heaters save on energy and utility costs. Actually, they use up to 40 percent less energy than a traditional tank. 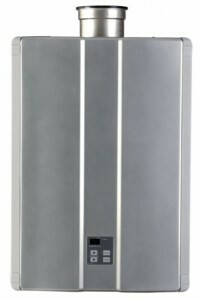 Rinnai on demand water heaters come in a variety of sizes. So, whether you live in a condo, an apartment, or in a house, Rinnai has got you covered. 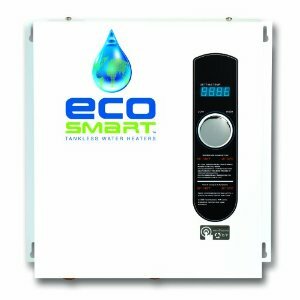 While traditional tank water heaters take up considerable space, which can be a serious dilemma in places where space is very limited, tankless water heaters are about the size of a small suitcase. That said, they can conveniently fit in compact spaces where a regular tank water heater can’t fit into, such as closets, narrow corners or even under the sink. 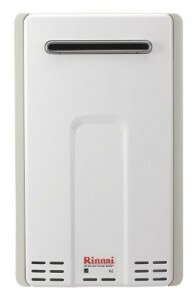 Rinnai tankless water heaters are quite durable. They are estimated to last up to 20 years, when correctly installed and regularly maintained, which is impressive. Additionally, every part of them is replaceable, if needed. If I had to pick some criticisms for Rinnai tankless water heaters, I’d have to say that they are a bit expensive. If you want to buy one of the units you’ll be looking at a $800-$1500 price tag. That’s a serious upfront investment. We’ve also found that several customers complained about the lack of Rinnai certified technicians that can install and repair this brand’s tankless water heaters. The Rinnai RU98IN Ultra-NOx condensing tankless water heater is a titan when it comes to natural gas tankless water heaters. I really don’t want to sound cliché but just look at it. This unit comes in two different models that support natural (Rinnai RU98IN) gas and propane (Rinnai RU98IP) to guarantee your maximum convenience, it promises a flow rate of an astounding 9.8 gallons per minute and it’s tankless, which means you’ll never have to worry about running out of hot water. The RU98IN is simply fascinating. It is compact, it is powerful and it is technologically fortified to ensure maximum efficiency. However, what I consider to be a little bit of a drawback is the fact that it’s an indoor heater (outdoor model is also available on Amazon if that’s what suits you best). I might be paranoid but I always thought that a tankless water heater is better kept outside, that way even if something goes wrong, it can be contained. Nevertheless, this Rinnai is still one of Japan’s most remarkable contributions in the field. This bad boy can easily cater for a huge home of 4 to 5 bathrooms or even a small apartment building. That being said, if you are living in a large home then this unit is one of your best options if not the best. Moving on to another Rinnai, only this one goes by the name of RUC98. This edition also supports both natural gas (Rinnai RUC98iN) and propane (Rinnai RUC98iP) as far as fuel goes and surprisingly it is as strong as the RU98 model. I’m saying surprisingly because this unit costs less yet it still delivers a flow rate of 9.8 gallons per minute, making it a solid contender. However, what this model lacks is the heavy duty forged brass webstone isolator valves which makes the RU98IN more durable and suitable for commercial use. Nevertheless, the RUC98 is still a solid pick as it can comfortably support a house hold of 4-5 bathrooms, not to mention the washing machines, dish washers and so on. The body design is even more appealing and compact which makes it possible to install it pretty much anywhere you like, not to forget that it comes with two venting options (concentric or PVC). The RUC98IN has ultra low NOx emissions and one of the best warranties in the field. 12 years on heat exchanger, 5 years on parts, one to two years on labour, that is never a bad sign. Next is the Rinnai RL94iN and by now I’m guessing you figured out the number in the name of Rinnais stands for the GPM of the machine. Speaking of which, this unit has a flow rate of 9.4 gallons per minute which is undeniably strong. This edition also supports both natural gas (Rinnai RL94iN) and propane (Rinnai RL94iP) for the same reason always. However, the RL94 is considerably more advanced technology-wise. The unit comes equipped with a digital controller for those of you who can’t shower unless the water is 99.9° sharp and also an error code indicator to save you the speculation game whenever you meet a bumper with your heater. With a 9.4 GPM, the RL94iN will comfortably take charge over a house of 4 bathrooms and the regular household machinery that require hot water. Nevertheless, the fact that this unit requires a special venting pipe which is sold separately is a bit of a bear. But then again, such is the case with almost every other on demand water heater out there. Fourth on the Rinnai list is the RL75iN and by now we’re over the fact that Rinnai tankless water heaters will often come in two models to support both natural gas (Rinnai RL75iN) and propane (Rinnai RL75iP). 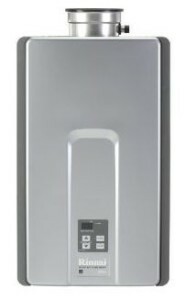 Moving on, the RL75 is typically a middle class tankless water heater because that is exactly what it’s been designed for. With a flow rate of 7.5 gallons per minute at a 35 degrees rise, this unit should excel in a household of 2 to 3 bathrooms. In fact, this unit is very compatible with almost every household, not only because it is powerful enough but also because it is technologically equipped to be of maximum convenience for the user. That is because the RL75iN is similarly equipped with a standard digital controller with error code indicator which will make life a lot easier for most users. Another aspect which is worthy of mentioning is the outstanding warranty offers that you can find on almost every Rinnai tankless water heater. This machine has a 12 years warranty on heat exchanger, 5 years on parts and one year on labor for residential installations. Number 5 comes the slightly less noticeable Rinnai V65 which also supports both natural gas (Rinnai V65IN) and propane (Rinnai V65IP). This on demand water heater is less noticeable simply because it is somewhere around the middle when compared to other Rinnai on demand water heaters. Nevertheless, that does not mean it is less worthy of your attention because it might just be what you need. As is power, the cost of these units is very influential and this one just happens to be much more digestible. With a steady flow rate of 6.5 gallons per minute, this unit should do very well in a household of two bathrooms or under and that is actually very convenient for a wide range of people. However, the V65I is missing a bit on the technological aspect as it does not support any digital preferences which would have been the cherry on top of the cake because if you ask me, this unit is not lacking anything significant. 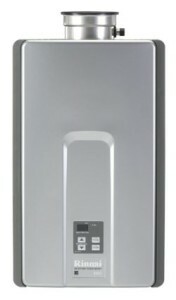 Last but not least is the Rinnai V65E which is your basic home on demand tankless water heater that will never fail you. This model supports natural gas (Rinnai V65EN) and propane (Rinnai V65EP) as well and it can easily keep up with any quality heater of the same caliber. With a flow rate of 6.6 gallons per minute, this unit can cater for a medium size household with 2 bathrooms and still work like a charm. However, if you expect any more out of this machine, you will be disappointed. Don’t get me wrong, this heater stands by its reputation and at that it will be excellent but if you need more power then you’re better off with a more powerful heat from this list. Other than that, this unit is very good, it is light weight and compact and most importantly, it is an outdoor unit. If you have a small family and one to two bathrooms then this Rinnai is for you. If you want to know more about how Rinnai on demand water heaters work, and what happens inside these units when you open the hot water tap, then you are in the right place. We did the research so you won’t have to. Down below you’ll find a run down of all the steps that it takes to heat the water to your desired temperature. Step 1 : When the water heater detects that there’s cold water flowing through the pipes, whether because you turned on a shower, washing machine, dishwasher or faucet, the PC board gets signaled to activate the flame igniter. Step 2 : A combustion fan turns on automatically to allow oxygen to get into the burner to ignite the flame as the gas valve opens at a low frequency allowing gas to flow to the burner. Once a flame is ignited and spreads over the burner, the igniter stops sparking — beginning the next sequence of operations in just a matter of seconds. Step 3 : The water in a tankless unit is heated as it flows through its heat exchanger, and exits from the hot water outlet pipe to travel through the pipes of the home or business to the water fixture where hot water is needed. In Condensing Tankless Water Heaters, the cold water is preheated as it flows through a secondary stainless steel (latent) heat exchanger, capturing any extra heat (or latent heat) before it escapes into the vent system. (PS : Condensing Tankless Water Heaters are very efficient (up to 98%), real energy savers and use inexpensive venting material.However, they are a bit expensive than their regular counterparts). Step 4 : Rinnai instantaneous water heaters adjust the incoming gas and oxygen to heat water to your desired temperature. Note that the higher the demand for hot water, the lower the GPM (gallons per minute). If the demand for hot water is low, the water heater uses smaller flames and less gas. Otherwise, the flames expand across the entire burner to heat more water. 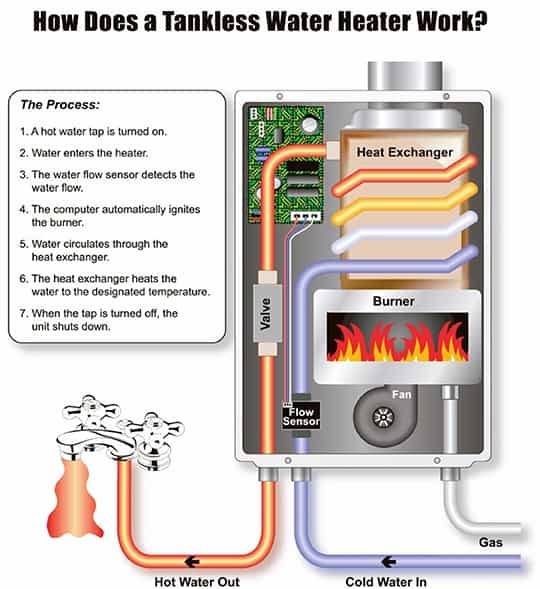 Tankless water heaters adjust their inner water heating process as needed to maintain your desired water temperature. Are the pipes coming out of the heater suppose to be bowed?